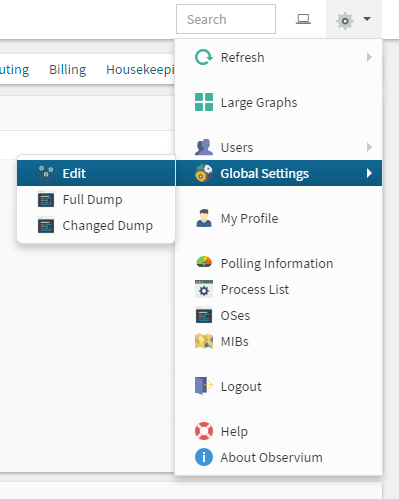 Observium now permits most settings to be configured via the Web UI. This makes it much easier to manage and maintain an Observium instance without requiring that users log in to the Observium server to make changes. The web-based configuration system is location in the Global Settings sub menu of the right-hand main "Cog" menu. As security precaution, the web-based configuration system won't allow you to modify a setting which has been set in the config.php, such a setting will be shown as uneditable and 'locked'. If a setting is modified in the web-based configuration system and later added to the config.php, the setting in the config.php will take precedence. If you'd prefer to hard-code a setting you find in the Web UI in config.php, hovering over the blue question mark icon will tell you the corresponding config.php setting to use.